Brand spanking new Addon for Web Browser Chrome! Now you can calculate a website's value with one click of a button. 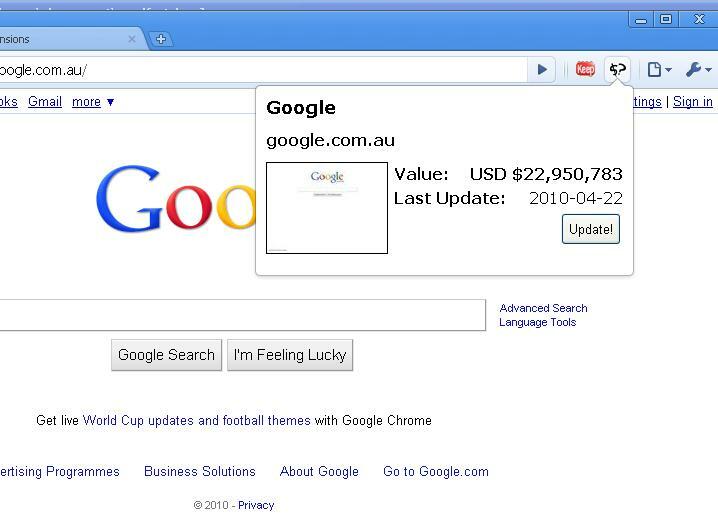 The value of the current website will be shown in a popup window from right inside your browser. See how to install and how to use below for more information. A window will popup, showing the value of the current website. Note: You can click the Update button to update the value, if it is more than 4 days old! This Addon is one of the many new tools we will be adding to RealWebWorth.com Stay tuned for more exciting tools..